I’ve heard that a lot of commercial law firms who who offer employment law advice to businesses are increasingly branching out into offering a full package of services which used to be the domain of the dreaded ‘Human Resources’ department. You know the kind of stuff: materials for appraisals, psychometric tests, staff-engagement/happiness questionnaires and so forth. Personally, I think these services are a bit of a farce, irrespective of who provides them and commercial firms should know better than to sully their reputation by getting mixed up with them. Anyhow, there was an absolute gem of a letter in the Digg Weekly Digest this week – a photo of a letter from some company’s human resources department who offered helpful suggestions in putting their constructive criticism across more, well, constructively! 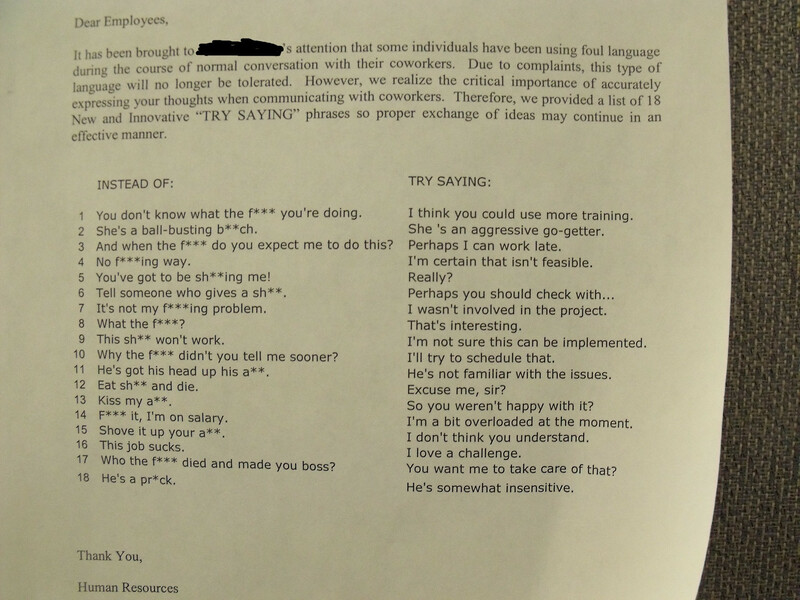 It has been brought to **********’s attention that some individuals have been using foul language during the course of a normal conversation with their co-workers. Due to complaints, this type of language will no longer be tolerated. However, we realize the critical importance accurately expressing your thoughts when communicating with co-workers. Therefore, we provided a list of 18 new and innovative "TRY SAYING" phrases so proper exchange of ideas may continue in an effective manner. You don't know what the f*** you're doing. I think you could use more training. And when the f*** do you expect me to do this? Perhaps I can work late. I'm certain that isn't feasible. You've got to be shi**ing me! Tell someone who gives a sh**! It's not my f***ing problem. I wasn't involved in the project. I'm not sure this can be implemented. Why the f*** didn't you tell me sooner? I'll try to schedule that. He's not familiar with the issues. So you weren't happy with it? F*** it, I'm on salary. I'm a bit overloaded at the moment. Who the f*** died and made you boss? You want me to take care of that? We tried that for a while; now we just drop our trousers (or skirts as the case may be) and receive a hard spanking for each swear word uttered, administered by the nominated swear monitor.